There's been a sudden increase in beautiful covers in my life. Check out these ones from HarperCollins that have gotten my attention recently. All summaries are from Goodreads. It's more in the style of urban fantasy covers than young adult... but I think it's badass. That girl is beautiful in the way she looks like she can cut down anyone who gets in her way. Another 2011 debut novel. I can't tell if the graininess is due to the resolution or not, but that is one gorgeous dress, in a gorgeous garden maze. It seems like a fantastical fairy tale-like story. I'm kind of wary about angel love triangles, but I do really like this cover, especially the title lettering, which reminds me a lot of the lettering for Beautiful Creatures and Beautiful Darkness. That, plus the purplish tint throughout, definitely puts the girl in a more ethereal light for me. Never underestimate the power of a contemporary realist novel. Contemporary fiction never sounds as exciting as all the paranormal stuff, but I have a feeling this could be really good. I'm not sure how much I like the models and their poses, but I like the vibrancy of the colors, and think that their costumes are a nice detailed touch. This is the sort-of spinoff from her Darkest Powers series. The cover is not as exciting and nice as the other ones here, but I really like how the earrings sparkles so stunningly against the rest of the more muted picture. The cover's setup reminds me a bit of the covers for Alison Croggon's books, which I'm okay with. There's not much about this book yet, but after the way she completely exceeded my expectations with Voices of Dragons, I can't wait for more from Carrie Vaughn, and I don't think anything she writes can go wrong (at least for me). This one about pirates sounds like it's going to be great... but look at that cover as well. The brilliancy of the light on steel, the golden feel of the entire thing. I'm just in awe. I WANT. So what do you guys think of these covers? Which would get your attention in a bookstore? Which one do you like most, or are most looking forward to? I definitely agree with Frankie, I think they are doing amazingly well with their recent covers! I've only seen the cover for Angelfire like Frankie but OMFG are these covers incredible and... and I want to read them all O_O I would definetely get all of these books if I saw them at the bookstore! I have to WoW these later xD! Thanks so much for pointing them out! I love the concept of Steel! Thanks for highlighting some awesome new books. I'm loving the book cover for Where I Belong. I so want to read that book, thanks for the heads up! My favourite out of the lot would have to be Steel, I agree with you the light glinting off the sword is brilliant and goes so well with the whole colour scheme of the cover and the wonderful text font and colour. I also love Where I Belong. The image more than anything, the title font not so much or maybe its the positioning but I'm willing to ignore it because the rest of the cover is just marvelous. 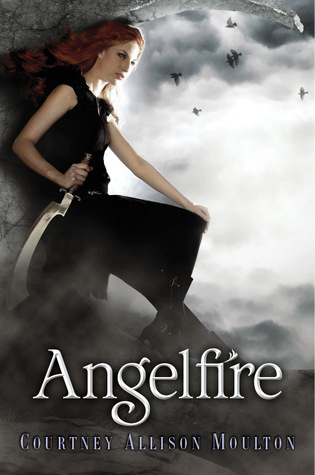 Angelfire I like at a glance but I don't love the cover, it would get me to pick up the book though and look at the synopsis. I also love the title font and colour. Entwined I would love if the picture wasn't grainy, I hope its jsut the resolution and not the actual cover image because pixelation turns mre off. And I agree with you that dress is gorgeous. Unearthly and The Gathering are my least favourite :( I don't have anything against monochrome, I actually love it but the shades used didn't work for me. 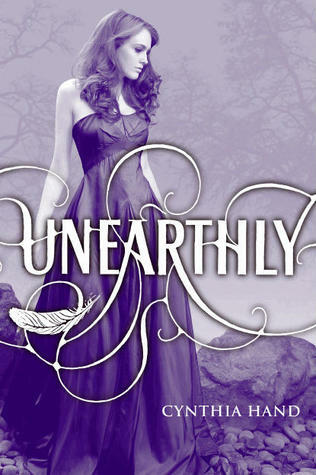 The title font is the only thing I love for Unearthly but it probably wouldn't make me check out the book some more. 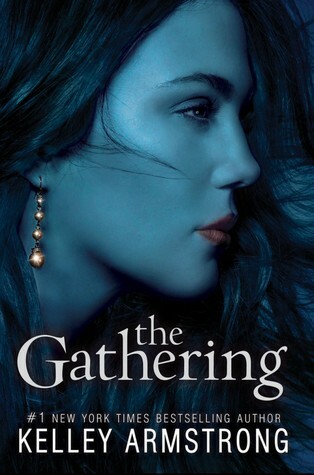 The Gathering I will read because its Kelley Armstrong and I love her books but I don't like the cover, the shimmering earring effect is wonderfully done but the lips should have probably been blue like the rest of the image even if I don't like how the blue looks here. That cover for STEEL looks freakin' amazing. Truly. I want that one right now. Pirates. Girl-fencer? all kinds of win there. Those covers look amazing. I have some serious cover love issues too. I added those books to my "to be read" pile :) The one I am looking forward to the most though is Angelfire! WHERE I BELONG looks great...I love the vibrant colors of the cover! 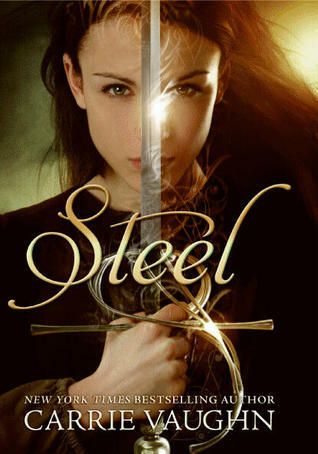 Love the Steel cover - must be the sword. Pirates? I'm in! 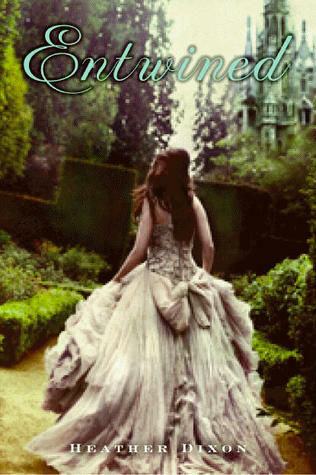 Ohhhh, I love the fairy-tale feel of Entwined - that would definitely grab me in a bookshop (even if only to drool over the dress)!